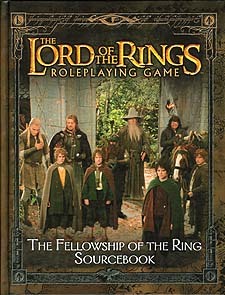 Join the Company of the Ring at the beginning of the greatest quest of all, and follow the paths of its members as they journey ever farther into shadow and peril. Enter Middle-earth and re-live the adventures of the Fellowship in this exhaustive guide to the people, places, and events of the The Fellowship of the Ring. From the pastoral hills of the Shire to the majesty of the Argonath and the Falls of Rauros, this book gives players and Tolkien fans alike a comprehensive overview of this beloved tale and its unforgettable characters. A detailed timeline and guide to the events of the story, including discussions about how the novel and the film diverge. In-depth write-ups of all the important characters from the story, including Aragorn, Gandalf, Arwen, Galadriel, Boromir, and Tom Bombadil. Game statistics for numerous enchanted items and artifacts, including Gandalf's staff, Glamdring, the Phial of Galadriel, Anduril, and the One Ring. Extensive coverage of all of the places visited by the Fellowship in their travels, including Hobbiton, Rivendell, and Khazad-dum, illustrated by over 15 maps.